David received a phone call from a lady in Bolton who wanted the Leyland Beaver for her Dad’s final journey. The Deceased’s main interest was restoring cars and he was working on a VW Camper when ill health stopped the progress of the restoration. Given that most of the discussion with the Family was about the VW Camper Van, David was surprised that his 69 year old lorry was chosen rather than the VW Camper Hearse which is based closer to Bolton and would possibly have been cheaper. The only Floral Tribute was an 18 inch ‘Heart’ and Gaynor, the Florist, was most helpful describing the Floral Tribute which helped David decide how best to secure it so that it would appear to float. 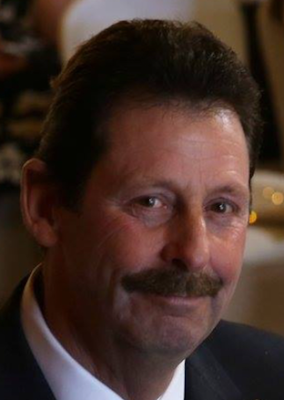 The Florist was only 50 yards from the Funeral Director and it was agreed that Gaynor would deliver the Floral Tribute direct to David’s lorry. The Funeral Director explained that the Deceased would be at the family home and as the Family had paid David direct he should go to the house as soon as the ‘Heart’ had been loaded and spend time there. As soon as a family has booked the lorry then a detailed planning operation takes place. With Bolton being over 200 miles from Bradford-on-Avon David planned to travel the day before the funeral and park the Leyland Beaver undercover as near as possible to the Funeral Directors. David has an arrangement with Kwik Fit which allows him to park the vintage lorry overnight before a funeral and luckily David’s wife spotted a Kwik Fit in Manchester Road with a cost effective B&B within 50 yards, ‘What more could a man ask for?’, David thought. A week before the funeral the weather forecast changed and a storm labelled, ‘The Beast from the East’ was scheduled to hit Britain with heavy snow being predicted across the Pennines. Given the risk of snow David decided to equip the Leyland Beaver ready for winter conditions and placed his ‘back-box’ on the rear of the deck. This structure adds weight onto the drive axle and this is supplemented by 9 cubic feet of 4 inch by 4 inch and 8 inch by 2 inch timbers. Also in the ‘back-box’ is equipment to assist the lorry cope with heavy snow and icy conditions and the list includes shovels, road grit, mats and rolls of stair carpet. The detailed planning for a trip includes where the lorry should be refuelled and where David can pick up a copy of the Times which he buys with a voucher each day solely for the Football and the Sudoku puzzles. David noticed that a Newsagent was next door to Gaynor’s Florist’s shop and David asked Gaynor to pop next door and ask if the owner would take the Times voucher and if a paper could be reserved for him to collect on the morning of the funeral. The Leyland Beaver had previously been to Horwich on the West side of Bolton and so most of the route planning had already been done for the trip to Farnworth on the East side of Bolton. The old girl knew her way through Wolverhampton, Stafford, Stone, Holmes Chapel, Knutsford and Warrington. When David joined the East Lancs A580 road for a short time he remembered being on that road in the 1950’s riding in the passenger seat of a Leyland Beaver bound for Liverpool to collect animal feed. David arrived at Kwik Fit around 1700 hours and he was surprised that the Manager, Wes, was much younger than he had imagined and that he was a Jamie Vardy look-a-like. David walked to the Highgrove B&B and Debbie, the Manager, was very friendly and gave him a quiet room. David was very lucky to find space in this B&B which costs £39 per night, including a cooked breakfast as most of the rooms are block booked by contractors working locally or Travelling Salesmen visiting companies in Bolton. 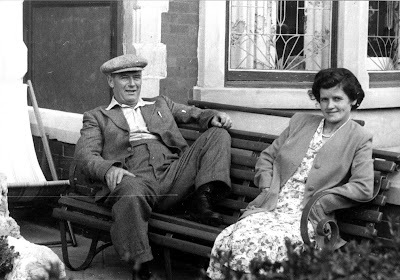 Debbie’s husband had been a Lorry Driver in the 1960’s and she moved a few residents around to accommodate David because he was involved in a funeral. The room was basic but clean and being called Highgrove caused David to smile as he doubted whether Charles or Camilla had ever crossed the threshold. Debbie advised David to go to Wetherspoons where he would get a cost effective meal and she wasn’t wrong. With a promotion, the price for a main meal, a pudding and a Coca Cola was less than £10 and this location was less than 100 yards from the B&B. David looked at the weather forecast before he went to bed, heavy snowfall was expected in Farnworth in the morning but David had no fears that the Leyland Beaver would cope with any conditions and he slept soundly. David awoke to find 4 inches of snow had landed, the main road was black, however, the side roads were reminiscent of a Christmas Card scene. Debbie had the radio on as she made the breakfasts, one gentleman was listening intently as he was planning to drive to Sheffield, however, as Debbie brought the cooked breakfast she whispered in David’s ear, ‘You’ll have no problems with the old lorry in the snow’. Wes at Kwik Fit got one of the lads to come in early to get David away before 0815 hours as rush hour conditions would mean 4 miles may take 45 minutes. David eventually got to the Funeral Directors at 0915 hours and the traffic was still gridlocked. David stopped on the main road and asked the driver behind him to hold back the traffic whilst he reversed into the side road. David drove into the other lane, stopped the traffic and everyone was patient as the 1950 Leyland Beaver spun round onto the virgin snow on the side road. Initially everything was going well, then David spotted a car in his wing mirror coming quickly towards him. The car driver then started to flash the headlights and use the horn. David stopped, went to the back of the lorry and found a woman who was shouting at him, with every other word being an expletive. She was annoyed that the lorry was stopping her getting out of the street and she drove over the pavement to get round, much to the annoyance of the drivers stopped on the main road, who had been exceptionally patient. Just about this time Gaynor arrived with the ‘Heart’ which David immediately fixed in place. David asked if Gaynor had spoken with the Newsagent and she said she had, but didn’t think that he would be of any help. Gaynor apologised for the behaviour of the woman driver and said that her attitude was typical for the area. Sheila, the Funeral Director overheard David talking to Gaynor about the Times and she commented ‘You won’t get a Times newspaper in this area, not in the Newsagent, nor in Lidl, you may get one in Tesco.’ Something told David to try the Newsagent and he entered the small shop, no one was in it apart from a small Asian man behind the counter. David asked if he had the Times and if he would take the voucher. The man said, ‘There is only one Times in the rack which has been specially ordered for a man who is working at the Funeral Directors today.’ David said, ‘I am that man,’ and he took the Times out of the rack, left the voucher on the counter as the Asian man looked quizzically at a man with a black beret who spoke with a North East accent, not what he was expecting, no doubt. David drove towards the house on untreated side roads, however, the Leyland Beaver being 5.5 tons gripped the loose snow. The family had cleared the snow away in front of their house and invited David in for a cup of tea. The Daughter of the Deceased told David that the coffin was in the house, the coffin lid was off and asked if he would have any problems. David said, ‘No problem,’ and he had a flashback to the 1950’s when it was commonplace for the Deceased to rest at home the night before their funeral. Coming from a simple two up two down house, despite the cramp conditions overall, the front room was never used and kept for Christmas Day, Weddings and Funerals. So the front room was the place where the Deceased would lie in the coffin with the curtains closed, mirrors turned backwards so that you couldn’t see your own grief, David would be invited to go in on his own as a young child, say his goodbyes and gently kiss the Deceased on the forehead. So as David crossed the threshold he was expecting to turn left into the front room, however, he was invited into the back room where everyone was and the Deceased lay in his coffin with his Grandchildren playing on the floor beneath and around him. David took off his Beret as a mark of respect and told the Deceased that he would take good care of him whilst he was on the lorry. The widow gave David an envelope with pictures of the Deceased restoring the VW Camper and as he sipped his tea David thought it was an honour to be invited into the house, however, he sensed that not all Carriage Masters would be comfortable with this situation. Getting into Overdale Crematorium wasn’t easy due to mourners parking cars near and opposite the entrance and only because of the tremendous lock did the Leyland Beaver get through the gates and other large vehicles would not have been able to make the turn. David left the crematorium at 1330 hours and was back home by 2300 hours despite refuelling at Morrison’s on the A579 and J P Nicholls in Tewkesbury. The trick to the 9.25 hours driving time was hitting Wolverhampton just before the start of the rush hour. The Family wanted the VW restored so that the Widow could go touring with her dogs, and the whole family were extremely pleased with everything David had done for them. During the next two days Britain was badly affected by heavy snow and high winds had caused drifting with some major roads being blocked, like the A46 north of Bath. Traffic movements were affected almost as bad as in 1964, however, there was a lot less snow and David wondered if the problems were caused by local councils cutting back on gritting and snow plough costs. In the modern era Articulated Lorries are hopeless on hills with little weight on the drive axle they get stuck on any slight incline, cars get trapped behind and snow ploughs can’t get near the problem areas to clear the roads. In 1950’s and 1960’s the world was very different. Most large haulage companies operated trunking services with lorries like Leyland Octopus eight wheelers and trailers running over night between major conurbations. These lorries were good on snowy roads with plenty of weight over the double drive axles and these regular trunk services used to keep the roads open. In addition local farmers were paid to put snow ploughs in front of their tractors and instructed to work through the night to keep a certain section of an A-Road clear. The best New Year’s gift for a Self Employed man is a phone call about a job early in the New Year and David was pleased to get a call on January 3rd from Emma Clay Funeral Arranger at John Stuart Funeral Directors in Melksham, Wiltshire. Melksham has proved to be a good location for Vintage Lorry Funerals. The Leyland Beaver has previously worked in the town for Bewley & Merrett and 5 times for D.J. Bewley whose premises are on Bank Street, on the opposite side of the road to John Stuart Funeral Directors. The opportunity arose because a Farmer’s Family had asked Emma Clay if she could find a Farm Tractor to pull a trailer to carry their Dad’s coffin and some hay bales, however, the Tractor which John Stuart had previously used for a Farmer’s Funeral was deemed to be too modern. As the Family were looking at the photograph of the ‘modern’ Tractor the Son of the Deceased happened to notice a framed picture of the 1950 Leyland Beaver and said, ‘That wagon is of the right age’, and it is the first time that David has been given a job solely because of the lorry’s age of 69 years. Emma phoned David, explained that the Family would like hay bales to be carried on the lorry, then she sent a copy of a picture of the Farm tractor pulling a trailer with a coffin and hay bales. Emma said that the hay bales were important and the Family could provide them if David couldn’t find any himself. The Family didn’t want the modern round shaped bales but the old fashioned rectangular bale shape which was initiated in 1936. The traditional way that Farmer’s funerals are undertaken is for hay bales to be loaded onto the deck of the trailer, single stacked, forming a C shape and thereby enveloping the front part of the coffin, which in David’s opinion looked wrong. His idea was to stack the bales in front of the coffin to create a display with significant height, which everyone would see, and have the coffin distanced from the hay bales so that it could also be clearly seen. David then designed a Hay Rig Theme using 5 bales stacked in three levels, depicting hay bales being collected off the field and taken to the farm. For those of you who have never worked on a farm then you should know that handling rectangular hay bales is a nightmare because parts of the hay become untangled from the bale and leave pieces of hay everywhere. David envisaged that if the Family had provided the hay bales that there would be horrendous implications for John Stuart Funeral Directors, carrying hay in their vehicles and for West Wiltshire Crematorium, as the hay bales would have been deposited in the flower area for someone else to collect. The solution was for David to supply the hay bales, fix them in place in his Garage at Bradford-on-Avon and keep them on the lorry during and after the funeral. 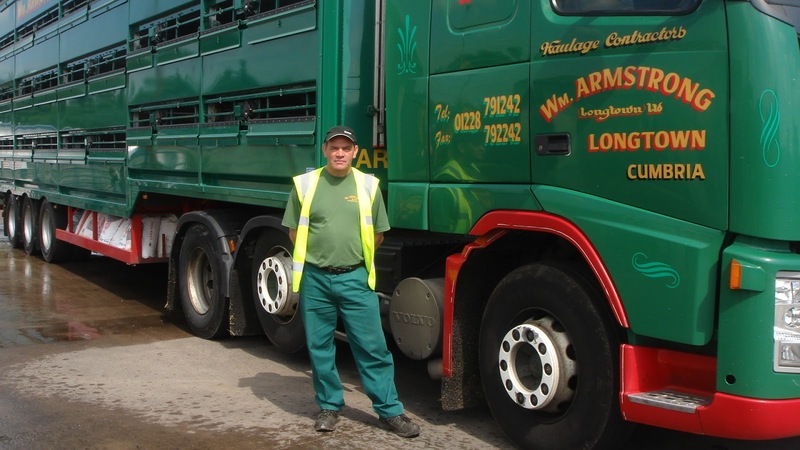 David also knew a man who could help him, Jim Pethers, one of Vintage Lorry Funerals Support Team, who has a Landscape Gardening business and he also has a small holding with cattle. Jim has been an amazing help to David over the years providing a number of items, notably a Victorian Rail Porter’s Sack Barrow, a 1950’s Milk Churn and a series of antique gardening tools. Jim arrived on a Saturday afternoon with 4 hay bales and one bale of straw and David showed Jim a sketch of how the Hay Rig Theme would look, with vertical poles at the rear to stop the bales slipping backwards. The key flower tray which would support the hay bales has been used many times before. It supported a Sack Truck in Highworth earlier in 2017/2018 and has been part of some of David’s memorable Themes, including ‘A Dolls House’, ‘Del Boy falling through the Bar’ and a ‘Tanker Refuelling a Plane’. The vertical poles had also previously been used during a Frome funeral, in a horizontal way as part of a ‘Horse Jump Theme’ for someone who loved horses, but unfortunately the crematorium was too far away for a Horse & Carriage to travel. So a plan was in place for David to use the bales during the funeral and afterwards he would take them back to the farm in Southwick, offload them and then help feed the cattle. Emma when providing information on the coffin, made David aware that it was made of plywood which would be strong enough and exposure to rain wouldn’t matter for the short journey down the A350 road to West Wiltshire Crematorium at Semington. However, the weather forecast didn’t look great for January 23rd so David decided to use his see-through sheet which can keep a coffin dry no matter how heavy the rain is. It is David’s opinion that some Funeral Directors may try to highlight a perceived wet weather weakness for Vintage Lorry Funerals in an attempt to dissuade a family from using the lorry. The truth of the matter is that David has carried the see-through sheet in a cover beneath the deck of the lorry since he started undertaking funerals in 2002. It has been rarely used, only twice previously for the funeral of a man in Nunney whose Family wanted him sheeted like a load, despite there being no rain and a Cardboard Coffin in Snodland for which the sheet was used solely to secure the coffin on a sunny day. David normally finds that although it can rain whilst he is loading the flowers, invariably the rain stops when the coffin is presented to the side roller on the deck. The only issue Vintage Lorry Funerals has regarding bad weather is that David Hall hasn’t marketed the use of his sheet well enough to confirm that his lorry is one for all seasons. So David and his wife put the sheet in place in their garage the day before the funeral and David slept well cognisant that he had in place the right facilities for a plywood coffin. When David got up at 0600 hours there was torrential rain and as he ate his breakfast he knew that he had made the right decision with the sheet. However, as David was putting on his boots he noticed that the rain had stopped and it never came back during the funeral. The back roads in Wiltshire were covered in water spilling off the fields, however, the 1950 Leyland Beaver was in place in the car park behind John Stuart Funeral Directors for 0745 hours. Emma arrived at 0815 hours and gave David a Car Park Permit. The coffin arrived from Devizes in a hearse and the team helped David put the sheet in place once the coffin was loaded. Everyone was amazed how quickly the sheet was secured and how it protected the coffin. 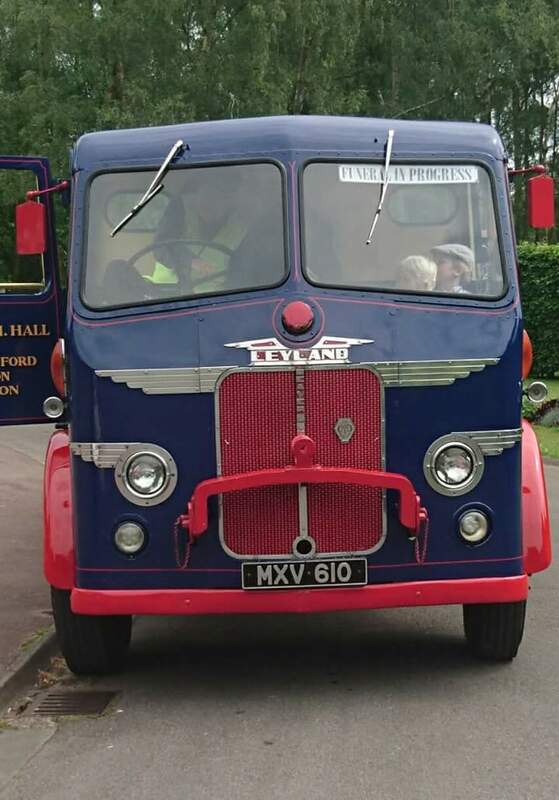 One of the Bearers, who had an old Fire Engine, was very interested in the quality of the paintwork on the Leyland Beaver and he found it hard to believe that most of the paintwork was untouched since 1996, with David’s wife providing regular protective coats of polish. The Farmer’s Family were delighted with everything David had done. The Short Horn Beasts were happy with their hay. West Wiltshire Crematorium staff members were pleased that no hay was left at the Semington site and quickly agreed to an article for ICCM, which goes to all crematoria sites, highlighting the steps that David took to help them. Pictures from the funeral will appear in a number of magazines and hopefully take the awareness of Vintage Lorry Funerals to a new level with the use of the see-through sheet dispelling any wet weather concerns. A man once told David that you should never complain about the rain, just wear a better coat. Those of you who find these blog articles interesting to read may find it hard to believe that as a 7 year old David was struggling to read and write. Having recently changed from a Primary School which concentrated on numbers, David was top of the class in maths but bottom in English at Easington Colliery Junior School. Easington was the location for the Billy Elliot film, however, there were no Ballet Dancers there in the 1960’s. David’s Teacher saw something in him that he couldn’t see in himself, but the Teacher put a lack of progress in English down to a lack of application rather than dyslexia that wasn’t known about in schools in the 1960’s. So frustrated was the Teacher with David’s lack of progress in reading that he contacted David’s Dad at work, who had to miss part of his shift at Easington Pit and come to school. In hindsight it is evident that the Teacher had David’s best interests at heart, however, he had a strange way of showing it. With David’s Dad standing alongside David in front of the whole class the Teacher said, ‘Unless this boy learns to read and write he’ll only be fit to sweep the streets of Easington Colliery.’ David was shocked and he didn’t know who was more embarrassed, him or his Dad. 50 years on, some of David’s compatriots in Alternative Funerals find it strange that he spends many hours building flower displays and Themes. Some think that David is daft and that he should have no contact with a family, turn up two hours before the funeral put on the coffin and flowers, get his cheque and leave the crematorium as soon as the coffin and flowers are off the lorry. David reminds these people that although some people get a number of chances at a marriage they get only one chance at a funeral and David always follows the philosophy of Bob Paisley and does his level best in everything that he attempts. David adopts the same approach whether he is creating a display of Floral Tributes on his lorry or arranging vegetables in an attractive pattern as he serves the Sunday lunch. Another important influence on David, when he was 7 year old, was Dennis Donnini V.C. who was born on November 17th 1925. David was very small for his age and having changed school at 7 years old he was regularly picked upon by taller boys. David noted in The Victor Comic a story about the heroic actions taken on January 18th 1945 by Dennis Donnini who won the Victoria Cross fighting German Troops in Holland towards the end of WWII. David may have had trouble reading out loud from a book, however, he was very sharp mentally and he noticed that the Ice Cream Shop in Easington Colliery was run by an Italian family called Donnini, could this be the same Donnini? On a Monday dinnertime David left the school walked down Seaside Lane and entered the shop which was deserted. David looked around and saw that a medal was in a case on the third shelf, he couldn’t see the medal but noticed the purple ribbon. A lady then came through the curtain and asked if she could help David. David pointed to the medal in the glass case and asked if that was the Victoria Cross won by Dennis Donnini. 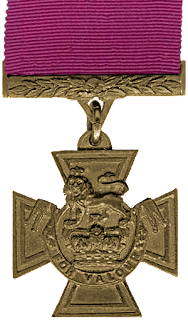 The lady then stood on a stool, took the glass case from the shelf, opened it and put the Victoria Cross in David’s hands. She then went on to explain that her Brother was 19 years old and was in a troop tasked to take positions fortified by the Germans. With heavy rain limiting the use of tanks the infantry was asked to attack initially two machine-gun positions. Dennis Donnini volunteered to lead the charge and took out one machine-gun with a grenade thrown from close range. During this action Dennis was shot in the head and he fell on the ground. He came to and crawled into a barn dodging the enemy bullets. After a short time he heard one his comrades crying for help in no man’s land. 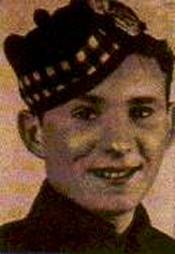 Donnini then put down his rifle, ran into no man’s land, under a hail of bullets, however, as soon as he started to lift the wounded soldier Dennis heard, ‘Nicht Schiessen’, the shooting stopped and Dennis dragged his comrade to safety. At this point Dennis was bleeding profusely from his head and it is thought that he knew he had been fatally wounded. He took a bag with grenades ran down the street throwing grenades into three houses before he was killed when a bullet hit the bag with the grenades which exploded. Any of the three events would have merited a Victoria Cross, however, perhaps, strategically the most import thing Dennis did was draw enemy fire and divert it from his comrades who attacked on the flanks and captured 30 Germans, including an Officer. 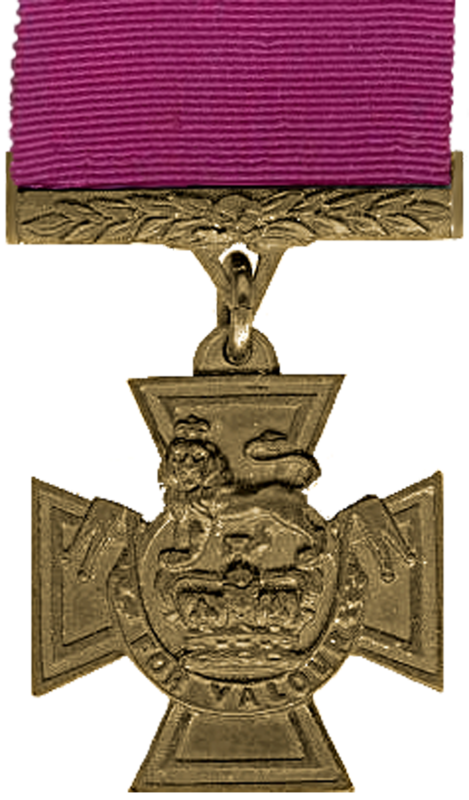 It is understood that the Wehrmacht Officer who witnessed Donnini’s actions recommended that he should by awarded the Victoria Cross and the citation bizarrely only mentioned two of the four acts of a valour and even left out perhaps Dennis’ bravest feat which was rescuing a comrade from no man’s land. Dennis’s Sister explained that both her Mum and Dad were detained in UK camps during WWII and there was a problem in the presentation of the medal because his parents were interned and even if they hadn’t been, no Italian was welcome inside Buckingham Palace. Dennis’ Sister showed David clippings from the local papers which told how King George met with Dennis’ parents in a pub to hand over the Victoria Cross and the King made arrangements for his parents to be released and to re-open the Ice cream shop in Easington Colliery. David saw from the pictures that Dennis was very small, only 4ft 10 inches and David suddenly thought that being small never stopped Dennis Donnini so David vowed that he would stand up for himself and use his brains to outwit people rather than no mans land his fists. At the age of 15 Football nearly changed the direction of David’s life when a scout from Huddersfield Town showed interest having watched David play for his school team. David’s Dad said that his son didn’t have enough skill to be a footballer and apparently the Scout agreed that David’s skills set could be improved by the club. However, it was the young lad’s leadership skills, will to win and determination that had caught the Scout’s eye. David’s Dad & Mum bought him a desk and encouraged him to stick in at school and become the first member of the Hall family to go to University. Fast forward now 45 years, David was pleasantly surprised to find that a Mural had been painted to commemorate Dennis Donnini, bravest of the brave, and a Memorial Garden had been planted just up the road from the former Colliery site. David was also relieved that in this area that was devastated when the pit closed, no one had attempted to deface the mural. David Hall has had some interesting people in the cab of his Leyland Beaver during and after a funeral, and three examples are described below. David was involved in perhaps his saddest funeral in Easthampstead Cemetery for a 32 year old, Jamie Madden, who had lost his life, whilst working under his car. The Deceased left a young wife and two children, a son aged almost 3 years and a daughter aged 11 months. David felt the family’s loss more than any other funeral because Jamie was the same age as David’s own son and Jamie’s son was the same age as David’s Grandson would have been had he not tragically passed away in June 2014, after only 15 months on this earth. Loosing his Grandson Freddie affected David deeply, he carries his picture above the windscreen in the cab and he often looks at the empty space above the seat that David had created next to the engine for Freddie, which he never saw. It was unbelievable that on the anniversary of Jamie’s death that David should be back in Easthampstead and some amazing things happened. Two young boys were attending their Granddad’s funeral and the older one Austin Stratford, aged 5 at the time, came over and asked David if he could have a ride in the Leyland Beaver. David then spoke with Austin’s parents who agreed that he could take Austin and his brother Dawson, aged 3 at the time, from the Flower Area at the crematorium to the cemetery. During a funeral from Calne to Semington Crematorium David was under the impression that the Deceased’s son Stuart Smith would be travelling in the cab with him. However, when David arrived at the house there was a change of plan and the Deceased’s Granddaughter Sara Jane Smith would accompany David. Sara wore trousers and climbed into the cab without a problem. Sara works in the motor industry and knows her way around a modern day lorry and she made some comparisons between the 1950 Leyland Beaver and those she normally sees. She said, ‘So no heater, no power steering, no synchromesh gearbox.’ As she was counting out the differences on her fingers she looked around the cab and asked, ‘and where does the driver sleep?’ Driver replied, ‘Back in the 1950’s Sara a driver never slept!’ David later explained in an email to Sara that large companies such as B.R.S. used to Double Shift a vehicle with a day man unloading and then reloading the lorry before handing over to a night man. 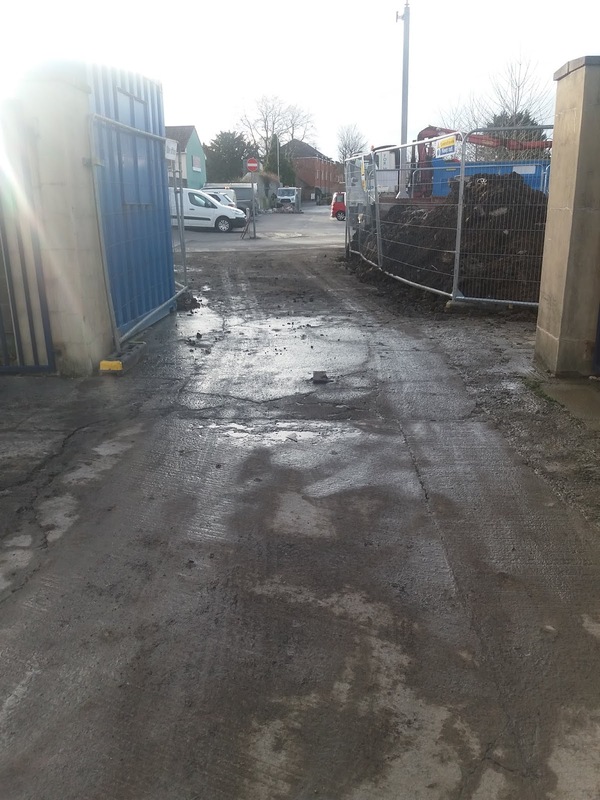 He drove to another depot through the night and then slept in digs whilst his lorry was unloaded and reloaded. So the lorry was never still and nobody slept in the cab. There were, however, smaller operators who used drivers that were less likely to obey the rules which limited a working shift to 11 hours. It is said that those drivers hardly ever slept in their cabs and when they did it was on a wooden board laid across the engine, or on the sheet rack on top of the cab or in amongst the load if the vehicle was a box van. For a funeral in Hollywell, North Wales, Shaun Parry, Grandson of the Deceased, paid for the funeral and asked to travel with David Hall in the cab because Shaun had his own haulage business. On the road to Pentrebychan Crematorium David asked Shaun if he had inherited the business from his Granddad and Dad. Shaun laughed saying, ‘I started the business myself and I employ my Dad who drives for me.’ Shaun went on to explain that after leaving school he became a trained Diesel Mechanic with Scania Trucks and then joined a local coachworks that built tipper bodies. During the evenings Shaun was engaged by a friend, who owned 8 Volvo Tippers, to service the fleet, which involved undertaking monthly inspections and rectifying any defects that had to be sorted that night. So whilst his colleagues at the coachworks were spending their evenings in the pub, Shaun would be in his boiler suit, hammer in his hand checking wheel-nuts. Shaun banked all the money he earned and enjoyed watching it grow. Then Shaun had an opportunity to buy two Foden Tippers second hand, having secured regular work 5 days per week from a local quarry. The Drivers took their instructions from the quarry staff, enabling Shaun not to be distracted whilst he was fitting tipping equipment at the coachworks. David was also very grateful that Shaun let him park the Leyland Beaver in his garage the night before his Granddad’s funeral and for providing transport to and from the B&B. David told Shaun that it was an honour to meet a young man who had made a good living for himself and his family by hard graft. In these days, in David’s opinion, too many young people don’t know what they want to do, drift into university rack up huge debts and come out of the process with no career prospects. Too many opt for an easy life and would rather sit at home playing computer games and the thought of doing an 8 hour shift followed by a 4 to 8 hour period of work which requires intense concentration, would be beyond their comprehension.